The New Kingdom of Egypt spanned the Eighteenth to Twentieth Dynasties (c. 1550-1077 BCE), and was Egypt’s most prosperous time. It was ruled by pharaohs Hatshepsut, Thutmose III, Akhenaten, Tutankhamun and Ramesses II. The Eighteenth Dynasty contained some of Egypt’s most famous pharaohs, including Hatshepsut, Akhenaten, Thutmose III, and Tutankhamun. Hatshepsut concentrated on expanding Egyptian trade, while Thutmose III consolidated power. Akhenaten’s devotion to Aten defined his reign with religious fervor, while art flourished under his rule and attained an unprecedented level of realism. Due to Akenaten’s lack of interest in international affairs, the Hittites gradually extended their influence into Phoenicia and Canaan. Ramesses II attempted war against the Hittites, but eventually agreed to a peace treaty after an indecisive result. The heavy cost of military efforts in addition to climatic changes resulted in a loss of centralized power at the end of the Twentieth Dynasty, leading to the Third Intermediate Period. New Kingdom: The period in ancient Egyptian history between the 16th century BCE and the 11th century BCE that covers the Eighteenth, Nineteenth, and Twentieth Dynasties of Egypt. Considered to be the peak of Egyptian power. Thutmose III: The sixth pharaoh of the Eighteenth Dynasty, who greatly consolidated political power through a series of military conquests. Hatshepsut: The fifth pharaoh of the Eighteenth Dynasty, who expanded Egyptian trade. Akhenaten: Pharaoh of the Eighteenth Dynasty known for his religious fervor to the god Aten. Tutankhamun: An Egyptian pharaoh of the 18th dynasty (ruled c. 1332 BC-1323 BC in the conventional chronology), during the period of Egyptian history known as the New Kingdom. He is popularly referred to as King Tut. Aten: The disk of the sun in ancient Egyptian mythology, and originally an aspect of Ra. Ramesses II: The third pharaoh of the Nineteenth Dynasty of Egypt, who made peace with the Hittites. Often regarded as the greatest, most celebrated, and most powerful pharaoh of the Egyptian Empire. The New Kingdom of Egypt, also referred to as the Egyptian Empire, is the period in ancient Egyptian history between 1550-1070 BCE, covering the Eighteenth, Nineteenth, and Twentieth Dynasties of Egypt. The New Kingdom followed the Second Intermediate Period, and was succeeded by the Third Intermediate Period. It was Egypt’s most prosperous time and marked the peak of its power. The Eighteenth Dynasty, also known as the Thutmosid Dynasty, contained some of Egypt’s most famous pharaohs, including Ahmose I, Hatshepsut, Thutmose III, Amenhotep III, Akhenaten (c. 1353-1336 BCE) and his queen Nefertiti, and Tutankhamun. Queen Hatshepsut (c. 1479 – 1458 BCE) concentrated on expanding Egypt’s external trade by sending a commercial expedition to the land of Punt, and was the longest-reigning woman pharaoh of an indigenous dynasty. Thutmose III, who would become known as the greatest military pharoah, expanded Egypt’s army and wielded it with great success to consolidate the empire created by his predecessors. These victories maximized Egyptian power and wealth during the reign of Amenhotep III. It was also during the reign of Thutmose III that the term “pharaoh,” originally referring to the king’s palace, became a form of address for the king. One of the best-known Eighteenth Dynasty pharaohs is Amenhotep IV (c. 1353-1336 BCE), who changed his name to Akhenaten in honor of Aten and whose exclusive worship of the deity is often interpreted as the first instance of monotheism. Under his reign Egyptian art flourished and attained an unprecedented level of realism. Toward the end of this dynasty, the Hittites had expanded their influence into Phoenicia and Canaan, the outcome of which would be inherited by the rulers of the Nineteenth Dynasty. Bust of Akhenaten: Akhenaten, born Amenhotep IV, was the son of Queen Tiye. He rejected the old Egyptian religion and promoted the Aten as a supreme deity. New Kingdom Egypt would reach the height of its power under Seti I and Ramesses II, who fought against the Libyans and Hittites. The city of Kadesh was a flashpoint, captured first by Seti I and then used as a peace bargain with the Hatti, and later attacked again by Ramesses II. Eventually, the Egyptians and Hittites signed a lasting peace treaty. 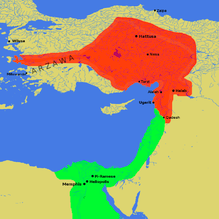 Egyptian and Hittite Empires: This map shows the Egyptian (green) and Hittite (red) Empires around 1274 BCE. Ramesses II had a large number of children, and he built a massive funerary complex for his sons in the Valley of the Kings. The Nineteenth Dynasty ended in a revolt led by Setnakhte, the founder of the Twentieth Dynasty. Temple of Ramesses II: Detail of the Temple of Ramesses II. The last “great” pharaoh from the New Kingdom is widely regarded to be Ramesses III. In the eighth year of his reign, the Sea Peoples invaded Egypt by land and sea, but were defeated by Ramesses III. The heavy cost of warfare slowly drained Egypt’s treasury and contributed to the gradual decline of the Egyptian Empire in Asia. The severity of the difficulties is indicated by the fact that the first known labor strike in recorded history occurred during the 29th year of Ramesses III’s reign, over food rations. Despite a palace conspiracy which may have killed Ramesses III, three of his sons ascended the throne successively as Ramesses IV, Ramesses VI and Ramesses VIII. Egypt was increasingly beset by droughts, below-normal flooding of the Nile, famine, civil unrest, and official corruption. The power of the last pharaoh of the dynasty, Ramesses XI, grew so weak that, in the south, the High Priests of Amun at Thebes became the de facto rulers of Upper Egypt. The Smendes controlled Lower Egypt even before Ramesses XI’s death. Menes eventually founded the Twenty-first Dynasty at Tanis. Hatshepsut ruled Egypt in the Eighteenth Dynasty (1478-1458 BCE), and brought wealth and a focus on large building projects. She was one of just a handful of female rulers. Describe the achievements of Hatshepsut in Ancient Egypt. Hatshepsut reigned Egypt from 1478-1458 BCE, during the Eighteenth Dynasty. She ruled longer than any other woman of an indigenous Egyptian dynasty. Hatshepsut established trade networks that helped build the wealth of the Eighteenth Dynasty. Hundreds of construction projects and statuary were commissioned by Hatshepsut, including obelisks and monuments at the Temple of Karnak. While not the first female ruler of Egypt, Hatshepsut’s reign was longer and more prosperous; she oversaw a peaceful, wealthy era. The average woman in Egypt was quite liberated for the time, and had a variety of property and other rights. Hatshepsut died in 1458 BCE in middle age, possibly of diabetes and bone cancer. Her mummy was discovered in 1903 and identified in 2007.
kohl: A black powder used as eye makeup. obelisks: Stone pillars, typically having a square or rectangular cross section and a pyramidal tip, used as a monument. co-regent: The situation wherein a monarchical position, normally held by one person, is held by two. Hatshepsut reigned in Egypt from 1478-1458 BCE, during the Eighteenth Dynasty, longer than any other woman of an indigenous Egyptian dynasty. According to Egyptologist James Henry Breasted, she was “the first great woman in history of whom we are informed.” She was the daughter of Thutmose I and his wife Ahmes. Hatshepsut’s husband, Thutmose II, was also a child of Thutmose I, but was conceived with a different wife. Hatshepsut had a daughter named Neferure with her husband, Thutmose II. Thutmose II also fathered Thutmose III with Iset, a secondary wife. Hatshepsut ascended to the throne as co- regent with Thutmose III, who came to the throne as a two-year old child. Statue of Hatshepsut: This statue of Hatshepsut is housed at the Metropolitan Museum of Art in New York City. Hatshepsut established trade networks that helped build the wealth of the Eighteenth Dynasty. This included a successful mission to the Land of Punt in the ninth year of her reign, which brought live myrrh trees and frankincense (which Hatshepsut used as kohl eyeliner) to Egypt. She also sent raiding expeditions to Byblos and Sinai, and may have led military campaigns against Nubia and Canaan. Hatshepsut was a prolific builder, commissioning hundreds of construction projects and statuary. She had monuments constructed at the Temple of Karnak, and restored the original Precinct of Mut at Karnak, which had been ravaged during the Hyksos occupation of Egypt. She installed twin obelisks (the tallest in the world at that time) at the entrance to this temple, one of which still stands. Karnak’s Red Chapel was intended as a shrine to her life, and may have stood with these obelisks. The Temple of Pakhet was a monument to Bast and Sekhmet, lioness war goddesses. Later in the Nineteenth Dynasty, King Seti I attempted to take credit for this monument. However, Hatshepsut’s masterpiece was a mortuary temple at Deir el-Bahri; the focal point was the Djeser-Djeseru (“the Sublime of Sublimes”), a colonnaded structure built 1,000 years before the Greek Parthenon. The Hatshepsut needle, a granite obelisk, is considered another great accomplishment. Hatshepsut Temple: The colonnaded design is evident in this temple. Hatshepsut was not the first female ruler of Egypt. She had been preceded by Merneith of the First Dynasty, Nimaathap of the Third Dynasty, Nitocris of the Sixth Dynasty, Sobekneferu of the Twelfth Dynasty, Ahhotep I of the Seventeenth Dynasty, Ahmose-Nefertari, and others. However, Hatshepsut’s reign was longer and more prosperous; she oversaw a peaceful, wealthy era. She was also proficient at self-promotion, which was enabled by her wealth. Hieroglyphs of Thutmose III and Hatshepsut: Hatshepsut, on the right, is shown having the trappings of a greater role. The word “king” was considered gender-neutral, and women could take the title. During her father’s reign, she held the powerful office of God’s Wife, and as wife to her husband, Thutmose II, she took an active role in administration of the kingdom. As pharaoh, she faced few challenges, even from her co-regent, who headed up the powerful Egyptian army and could have unseated her, had he chosen to do so. The average woman in Egypt was quite liberated for the time period. While her foremost role was as mother and wife, an average woman might have worked in weaving, perfume making, or entertainment. Women could own their own businesses, own and sell property, serve as witnesses in court cases, be in the company of men, divorce and remarry, and have access to one-third of their husband’s property. Hatshepsut died in 1458 BCE in middle age; no cause of death is known, although she may have had diabetes and bone cancer, likely from a carcinogenic skin lotion. Her mummy was discovered in the Valley of the Kings by Howard Carer in 1903, although at the time, the mummy’s identity was not known. In 2007, the mummy was found to be a match to a missing tooth known to have belonged to Hatshepsut. Osirian Statues of Hatshepsut: These statues of Hatshepsut at her tomb show her holding the crook and flail associated with Osiris. After her death, mostly during Thutmose III’s reign, haphazard attempts were made to remove Hatshepsut from certain historical and pharaonic records. Amenhotep II, the son of Thutmose III, may have been responsible. The Tyldesley hypothesis states that Thutmose III may have decided to attempt to scale back Hatshepsut’s role to that of regent rather than king. The Third Intermediate Period (c. 1069-664 BCE) spanned the Twenty-first to Twenty-sixth Dynasties, and was marked by internal divisions within Egypt, as well as conquest and rule by foreigners. The period of the Twenty-first Dynasty was characterized by the country’s fracturing kingship, as power became split more and more between the pharaoh and the High Priests of Amun at Thebes. Egypt was temporarily reunified during the Twenty-second Dynasty, and experienced a period of stability, but shattered into two states after the reign of Osorkon II. Civil war raged in Thebes and was eventually quelled by Osorkon B, who founded the Upper Egyptian Libyan Dynasty. This dynasty collapsed, however, with the rise of local city-states. The Twenty-fourth Dynasty saw the conquest of the Nubians over native Egyptian rulers, and the Nubians ruled through the Twenty-Fifth Dynasty, when they expanded Egyptian power to the extent of the New Kingdom and restored many temples. Due to lacking military power, however, the Egyptians were conquered by the Assyrians toward the end of the Twenty-fifth Dynasty. The end of the Third Intermediate Period and the Twenty-sixth Dynasty saw Assyrian rule over Egypt. Although some measure of independence was regained, Egypt faced pressure and eventual defeat at the hands of the Persians. Nubia: A region along the Nile river, located in northern Sudan and southern Egypt. Assyrians: A major Mesopotamian East Semitic-speaking people. High Priests of Amun: The highest-ranking priest in the priesthood of the Ancient Egyptian god, Amun. Assumed significant power along with the pharaoh in the Twenty-First Dynasty. The Third Intermediate Period of Ancient Egypt began with the death of the last pharaoh of the New Kingdom, Ramesses XI in 1070 BCE, and ended with the start of the Postdynastic Period. The Third Intermediate Period was one of decline and political instability. It was marked by a division of the state for much of the period, as well as conquest and rule by foreigners. However, many aspects of life for ordinary Egyptians changed relatively little. The period of the Twenty-first Dynasty was characterized by the country’s fracturing kingship. Even in Ramesses XI’s day, the Twentieth Dynasty of Egypt was losing its grip on power in the city of Thebes, where priests were becoming increasingly powerful. The Amun priests of Thebes owned 2/3 of all the temple lands in Egypt, 90% of ships, and many other resources. Consequently, the Amun priests were as powerful as the Pharaoh, if not more so. After the death of Ramesses XI, his successor, Smendes I, ruled from the city of Tanis, but was mainly active only in Lower Egypt. Meanwhile, the High Priests of Amun at Thebes effectively ruled Middle and Upper Egypt in all but name. During this time, however, this division was relatively insignificant, due to the fact that both priests and pharaohs came from the same family. The country was firmly reunited by the Twenty-second Dynasty, founded by Shoshenq I in approximately 943 BCE. Shoshenq I descended from Meshwesh immigrants originally from Ancient Libya. This unification brought stability to the country for well over a century, but after the reign of Osorkon II, the country had shattered in two states. Shoshenq III of the Twenty-Second Dynasty controlled Lower Egypt by 818 BCE, while Takelot II and his son Osorkon (the future Osorkon III) ruled Middle and Upper Egypt. In Thebes, a civil war engulfed the city between the forces of Pedubast I, a self-proclaimed pharaoh. Eventually Osorkon B defeated his enemies, and proceeded to found the Upper Egyptian Libyan Dynasty of Osorkon III, Takelot III, and Rudamun. This kingdom quickly fragmented after Rudamun’s death with the rise of local city-states. The Nubian kingdom to the south took full advantage of the division of the country. Nubia had already extended its influence into the Egyptian city of Thebes around 752 BCE, when the Nubian ruler Kashta coerced Shepenupet into adopting his own daughter Amenirdis as her successor. Twenty years later, around 732 BCE, these machinations bore fruit for Nubia when Kashta’s successor Piye marched north in his Year 20 campaign into Egypt, and defeated the combined might of the native Egyptian rulers. Following his military conquests, Piye established the Twenty-fifth Dynasty and appointed the defeated rulers as his provincial governors. Rulers under this dynasty originated in the Nubian Kingdom of Kush. Their reunification of Lower Egypt, Upper Egypt, and Kish created the largest Egyptian empire since the New Kingdom. They assimilated into Egyptian culture but also brought some aspects of Kushite culture. During this dynasty, the first widespread building of pyramids since the Middle Kingdom resumed. The Nubians were driven out of Egypt in 670 BCE by the Assyrians, who installed an initial puppet dynasty loyal to the Assyrians. Nubian Pharaohs: Statues of the Nubian Pharaohs of the Twenty-fifth Dynasty. Upper Egypt remained under the rule of Tantamani for a time, while Lower Egypt was ruled by the Twenty-sixth Dynasty, starting in 664 BCE. Although originally established as clients of the Assyrians, the Twenty-sixth Dynasty managed to take advantage of the time of troubles facing the Assyrian empire to successfully bring about Egypt’s political independence. In 656 BCE, Psamtik I (last of the Twenty-sixth Dynasty kings) occupied Thebes and became pharaoh, the King of Upper and Lower Egypt. He proceeded to reign over a united Egypt for 54 years from his capital at Sais. Four successive Saite kings continued guiding Egypt through a period of peace and prosperity from 610-525 BCE. Unfortunately for this dynasty, however, a new power was growing in the Near East: Persia. Pharaoh Psamtik III succeeded his father, Ahmose II, only six months before he had to face the Persian Empire at Pelusium. The new king was no match for the Persians, who had already taken Babylon. Psamtik III was defeated and briefly escaped to Memphis. He was ultimately imprisoned, and later executed at Susa, the capital of the Persian king Cambyses. With the Saite kings exterminated, Camybes assumed the formal title of Pharaoh. Ancient Egypt went through a series of occupations and suffered a slow decline over a long period of time. First occupied by the Assyrians, then the Persians, and later the Macedonians and Romans, Egyptians would never again reach the glorious heights of self-rule they achieved during previous periods. After a renaissance in the 25th Dynasty, ancient Egypt was occupied by Assyrians, initiating the Late Period. In 525 BCE, Egypt was conquered by Persia, and incorporated into the Achaemenid Persian Empire. In 332 BCE, Egypt was given to Macedonia and Alexander the Great. During this period, the new capital of Alexandria flourished. Egypt became a Roman province after the defeat of Marc Antony and Queen Cleopatra VII in 30 BCE. During this period, religious and other traditions slowly declined. hieroglyphics: A formal writing system used by ancient Egyptians, consisting of pictograms. pagan: A person holding religious beliefs other than those of the main world religions, Christianity, Judaism, and Islam. Hellenistic: Relating to Greek history, language, and culture, during the time between the death of Alexander the Great and the defeat of Mark Antony and Cleopatra in 31 BCE. After a renaissance in the Twenty-fifth dynasty, when religion, arts, and architecture (including pyramids) were restored, struggles against the Assyrians led to eventual conquest of Egypt by Esarhaddon in 671 BCE. Native Egyptian rulers were installed but could not retain control of the area, and former Pharaoh Taharqa seized control of southern Egypt for a time, until he was defeated again by the Assyrians. Taharqa’s successor, Tanutamun, also made a failed attempt to regain Egypt, but was defeated. Having been victorious in Egypt, the Assyrians installed a series of vassals known as the Saite kings of the Twenty-sixth Dynasty. In 653 BCE, one of these kings, Psamtik I, was able to achieve a peaceful separation from the Assyrians with the help of Lydian and Greek mercenaries. In 609 BCE, the Egyptians attempted to save the Assyrians, who were losing their war with the Babylonians, Chaldeans, Medians, and Scythians. However, they were unsuccessful. In 525 BCE, the Persians, led by Cambyses II, invaded Egypt, capturing the Pharaoh Psamtik III. Egypt was joined with Cyprus and Phoenicia in the sixth satrapy of the Achaemenid Persian Empire, also called the Twenty-seventh Dynasty. This ended in 402 BCE, and the last native royal house of dynastic Egypt, known as the Thirtieth Dynasty, was ruled by Nectanebo II. Persian rule was restored briefly in 343 BCE, known as the Thirty-first Dynasty, but in 332 BCE, Egypt was handed over peacefully to the Macedonian ruler, Alexander the Great. Alexander the Great was welcomed into Egypt as a deliverer, and the new capital city of Alexandria was a showcase of Hellenistic rule, capped by the famous Library of Alexandria. Native Egyptian traditions were honored, but eventually local revolts, plus interest in Egyptian goods by the Romans, caused the Romans to wrest Egypt from the Macedonians. Egypt became a Roman province after the defeat of Marc Antony and Queen Cleopatra VII in 30 BCE. Some Egyptian traditions, including mummification and worship of local gods, continued, but local administration was handled exclusively by Romans. The spread of Christianity proved to be too powerful, and pagan rites were banned and temples closed. Egyptians continued to speak their language, but the ability to read hieroglyphics disappeared as temple priests diminished.